1 of 3 Heat oven to 375 degrees F. Coat a 8 x 8 x 2-inch baking pan with nonstick cooking spray; set aside. 2 of 3 In a small bowl, whisk flour, baking powder and salt together. In a large bowl, beat sugar and butter on medium-high speed until fluffy. Beat in vanilla. Reduce speed to low and beat in milk, then flour mixture. Stir in oats and 1 cup of the chocolate chips. 3 of 3 Spread batter into prepared baking pan. Bake at 375 degrees F for 35 minutes or until wooden pick inserted in center comes out clean. Cool completely on a wire rack. 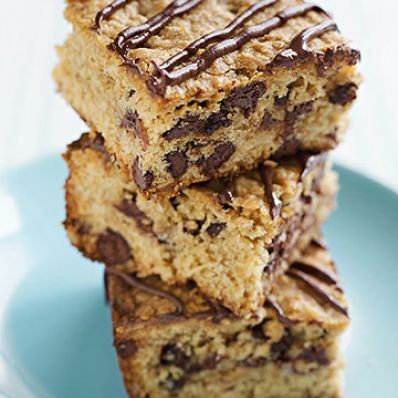 Microwave remaining 1/4 cup chocolate chips for 30 seconds; stir until smooth and drizzle over bars. Cut into squares.